The game is sweet, even the blind have something to share in it. Mr. Kamara Colson is coming to Zambia in July 2011 after the Uganda Draughts Federation's election which is to take place next month in June 2011. Mr. Kamara Kolson is among the African renowned draughts players who has travelled to different countries around the world for international draughts matches. 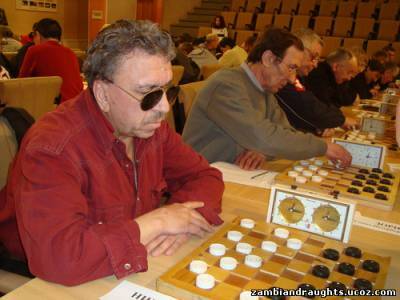 Mr Kamara playes both International 10x10 and draughts 8x8 known as Pool Checkers. His purpose of coming to Zambia is to meet the ZDF memebers so that he can discuss with them the way foward for the game of draughts 8x8(Pool checkers) in Africa. 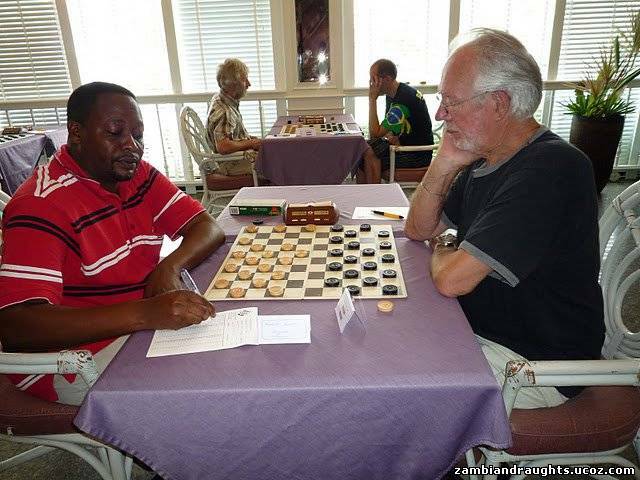 Kamara Colson in a red T-Shirt playing international 10x10 draughts. 27th May - one day before the final day of the Netherllands 10x10 world cup match. The tournament was won by Kennedy "Klinsman" Phiri with 24 points, followed by Albert "Scorpion" Shamuwele with 22 points and Alimon "Ronaldo" Mshanga tied with Mwaaza "Veteran" Sakala at 20 points each. The tournament was organised by Mwaaza "Veteran" Sakala and Mr. Makina Matthews as the treasurer. The Provincial Tournament was participated by the well known great players from all the corners of Lusaka, and these are some of the players who featured in the tournament: Albert "Scorpion" Shamuwele, Alimon "Ronaldo" Mshanga, Kennedy "Klinsman" Phiri, Matthwes "Computer" Makina, Joseph Chioko, Gilbert, Pierry, Mwaaza "Veteran" Sakala, etc. 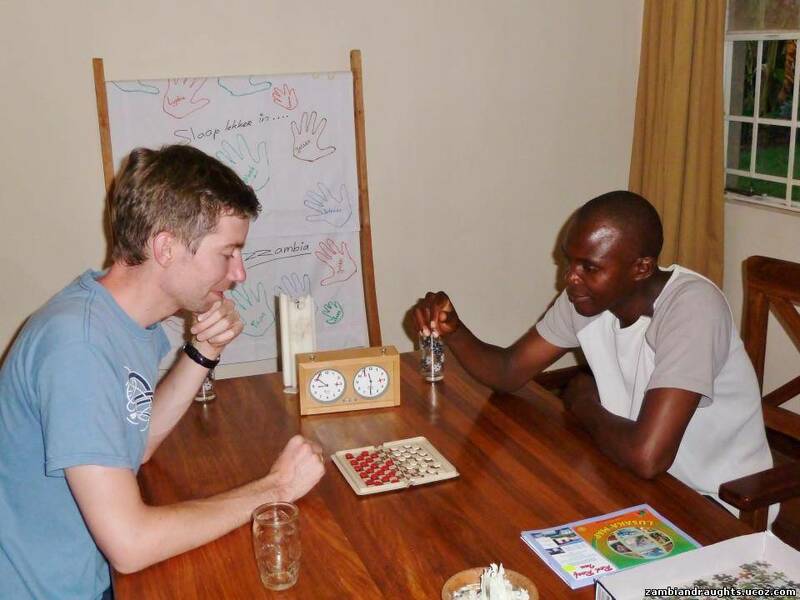 Draughts is the most common board game in Zambia and Africa at large which is played everywhere including market places,work places, Schools, Prisons etc. 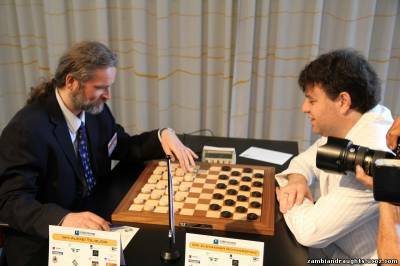 Players enjoy and feel more comfortable to use nick names than their real names in the draughts community. Some of the Zambian interesting nick names are; Kennedy " Klinsman" Phiri, Alimon "Ronaldo" Mshanga, "Albert "Scorpion" Shamuwele, Elias " Kandende "Banda and etc.